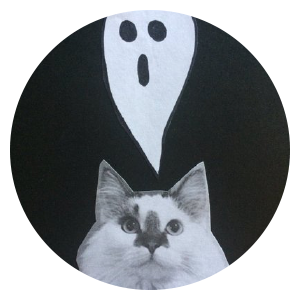 artificial ghost: a ghost created though the collective imagination and energy of a group of people. Part of A Repository of Paranormal Knowledge Series. black-eyed children (aka Black Eyed Kids or BEKS) are paranormal creatures resembling children, usually between the ages 6 and 16, with pale skin and black eyes. These creatures are often seen hitchhiking or panhandling. They might appear on your doorstep asking for help escaping an unseen danger. People note their hypnotic powers and relentless requests. Legends of these black-eyed children begin in the 1990s. Part of A Repository of Paranormal Knowledge Series. catoptromancy: divination using a mirror (more here). clairvoyance: the “ability to gain information about an object, person, location or physical event through extrasensory perception” (source). crisis apparition: an apparition of someone recently deceased, who visits someone they have a close connection with (often with the purpose to say good bye). doppelganger: an apparition of a living person, which could be a death omen or an out-of-body projection. ghost light: a mysterious ball (or irregular shape) of light with no natural explanation that often appears at night in remote locations. Ghost lights usually come in yellow or white, but can be red, blue, or orange. Part of A Repository of Paranormal Knowledge Series. ghost racket: The slang “ghost racket” was used during the late 19th century to describe the con of posing as a medium or physic so to draw money out of vulnerable people (more here). hellhound: supernatural dog that appears in folklore around the world; “They are often assigned to guard the entrances to the world of the dead, such as graveyards and burial grounds, or undertake other duties related to the afterlife or the supernatural, such as hunting lost souls or guarding a supernatural treasure” (source). lithoboly: a mysterious raining or hailing down of stones that have been occasionally reported in incidences of witchcraft and possession. parapsychology: “a field of study concerned with the investigation of evidence for paranormal psychological phenomena (as telepathy, clairvoyance, and psychokinesis)” (source). precognition: the psychic ability to see things in the future. screaming skulls: ghosts in/attached to human skulls that haunt a location, most commonly places in England. shadow person: a dark mass in the shape of a humanoid figure that is perceived as paranormal by the viewer. Meth addicts have commonly reported seeing these people (b/c of sleep deprivation), along with those suffering from sleep paralysis. A famous paranormal example is The Hat Man. sleep paralysis: “[…] occurs when, in transition between sleeping and wakefulness, the mind is alert but the body still sleeping. For most people, this happens during their waking process; while REM sleep allows for sight and hearing, movement is suppressed. Typically, this muscle atonia is accompanied by the idea of a direct threat: the hallucination of an intruder in the room, or something or someone pressing down physically on your chest” (source). spiritualism: (1) a belief that spirits of the dead can communicate with the living (i.e. through mediums); (2) a religious movement popular during the late 1800s and early 1900s (more here). stone tape theory: “The Stone Tape theory is the speculation that ghosts and hauntings are analogous to tape recordings, and that electrical mental impressions released during emotional or traumatic events can somehow be “stored” in moist rocks and other items and “replayed” under certain conditions. The idea was first proposed by British archaeologist turned parapsychologist Thomas Charles Lethbridge in 1961. Lethbridge believed that ghosts were not spirits of the deceased, but were simply non-interactive recordings similar to a movie” (source). street light interference: the claimed ability that individuals can turn off street lamps (or security lights) by walking underneath them. The term was first coined by paranormal author, Hilary Evans. Part of A Repository of Paranormal Knowledge Series.